Clearly the One Ring slipped off the hands of Isildur and Gollum to further its own work to return to its master. So why did it not then slip off Frodo at any of the opportune moments in which a Nazgûl was near (e.g. Weathertop, Flight to the Ford, etc.)? 'Behind that [Bilbo finding the ring] there was something else at work, beyond any design of the Ring-maker. I can put it no plainer than by saying that Bilbo was meant to find the Ring, and not by its maker. In which case you also were meant to have it. And that may be an encouraging thought' ("The Shadow of the Past," The Fellowship of the Ring, 81). If Frodo was "meant to have it," then it may be he was meant to keep it by that "something else at work." Keep in mind that Frodo didn't wear the Ring for very long while the Nazgûl were near. Even if the Ring was trying to slip off his finger, it might not have succeeded simply because his fist was clenched or his finger was not pointing towards the ground. Most of the time, the Ring was safely on a chain around his neck. Frodo did not put the Ring on at the Ford. On Weathertop, he put on the Ring, but the text suggests that it was still safely on the chain around his neck. He shut his eyes and struggled for a while; but resistance became unbearable, and at last he slowly drew out the chain, and slipped the Ring on the forefinger of his left hand. In any case, it is likely that you (and Gandalf) are right and that Frodo was not meant to lose the Ring as suggested in your quote from The Shadow of the Past. Tolkien (or at least knowledgeable characters like Gandalf) tells us several times that there is "something" that is guiding major events. He bitterly regretted his foolishness, and reproached himself for weakness of will; for he now perceived that in putting on the Ring he obeyed not his own desire but the commanding wish of his enemies. Fellowship of the Ring Book I Chapter 12: "Flight to the Ford"
This is the only time in the books when Frodo uses the Ring within spitting distance of a servant of Sauron; there are other occasions where he nearly does, but always stops himself and always keeps a firm grip on the chain (which the Ring can't slip off). Out-of-universe, obviously because it would have cut the story quite short. 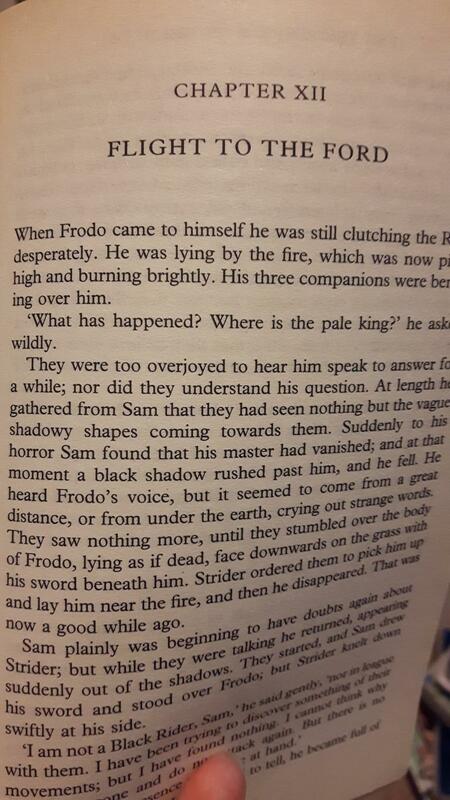 In-universe: Frodo was never using the ring in the way Bilbo or Gollum used it, i.e., as an everyday tool to get invisible for whatever mischievous or humorous reason. In the few moments he did use it, it was only after a struggle to avoid using it; and then it was not a benefit for him at all. The ring wanted to be used, but Frodo resisted. Incidently, he was at all times moving in the generally correct direction; certainly faster than in all the centuries before. Even the slight detour over Rivendell or Lothlorien was in favour of the ring; just imagine what would have happened if the Ring had been picked up by one of the Elves (or if one of the humans that tried had succeeded). It has been quite a while since I read the books, but here is how I remember things. Bilbo absolutely did not trust the ring to not slip off and be lost. He carried the ring on a chain in his pocket and he could slip his finger in the ring while it was still chained. I believe Frodo was told some of this, though I can't remember if was by Gandalf or through Bilbo's letter. I believe Frodo likewise carried the ring around on a chain, though he had the chain around his neck. If the ring is spiritual in nature then maybe he chose not to use it. Maybe the need to resist was't as strong as the compulsion. Why did the Nazgûl not attack a second time at Weathertop?